Because my weekend has been a bit higgledy piggledy, I didn’t do my usual weekly shop yesterday. So, today, I have been hunting through the fridge and freezer for some ingredients before I restock them again tomorrow. In the freezer, I found some mini chicken breast fillets. Bonus! 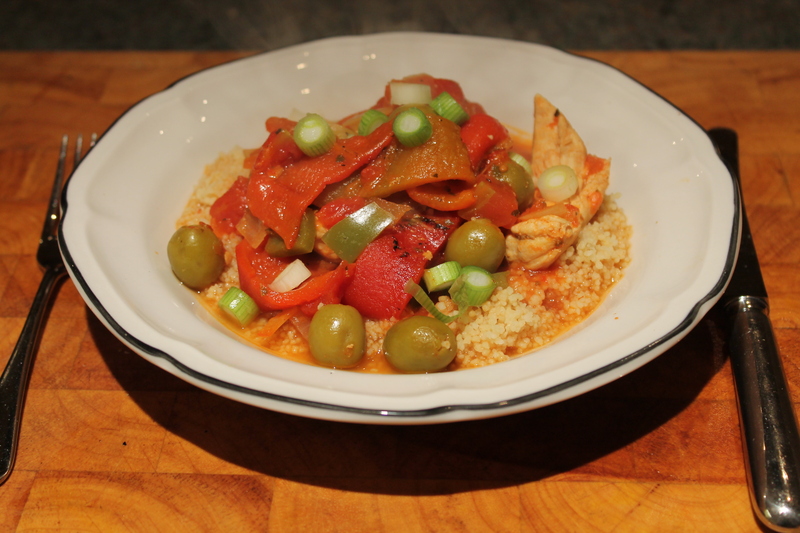 I knew I had cous cous in the cupboard; there was a jar of green olives hanging around, along with a jar of roasted red peppers, and there we had it – a meal was made. This was also seriously easy to make and took less than 30 minutes. This will serve 4. Enjoy! 1. Chop the onion and garlic and add to a large pan with the olive oil. Cook over a medium heat for 2 minutes, then add the chicken. Brown for 2-3 minutes (they don’t need to cook all the way through) then add the brandy. Allow to reduce. 2. 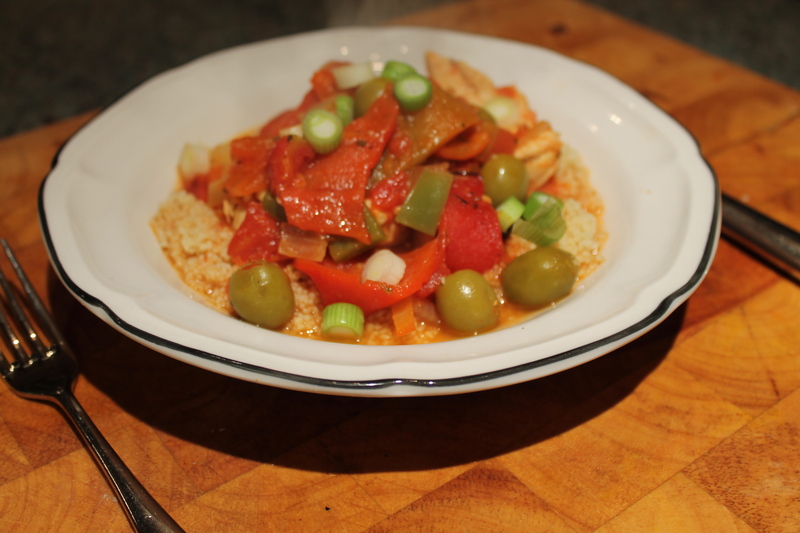 Tip in the chopped tomatoes, vegetable stock, olives, sliced red peppers, smoked paprika and oregano. Simmer for 10-15 minutes, adding the sliced green pepper for the final couple of minutes. 3. For the cous cous, tip into a large bowl with the ras el hanout and a little salt and pepper, and add 400ml boiling water. Leave to sit until all of the water has been absorbed. 4. 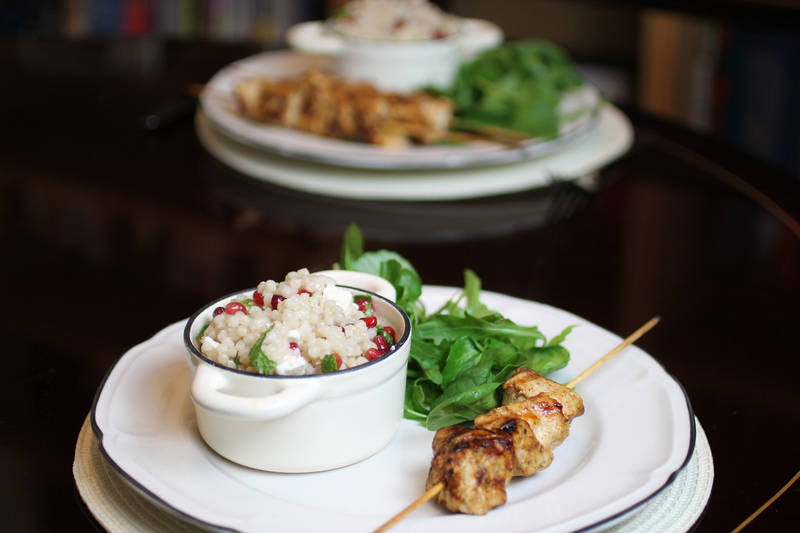 To serve, pile the cous cous into bowls and top with the casserole, making sure you get plenty of the juice. If you ever find scallops cheap, buy them up. They freeze really well and you can defrost the little ones so quickly for a delicious dish like this. 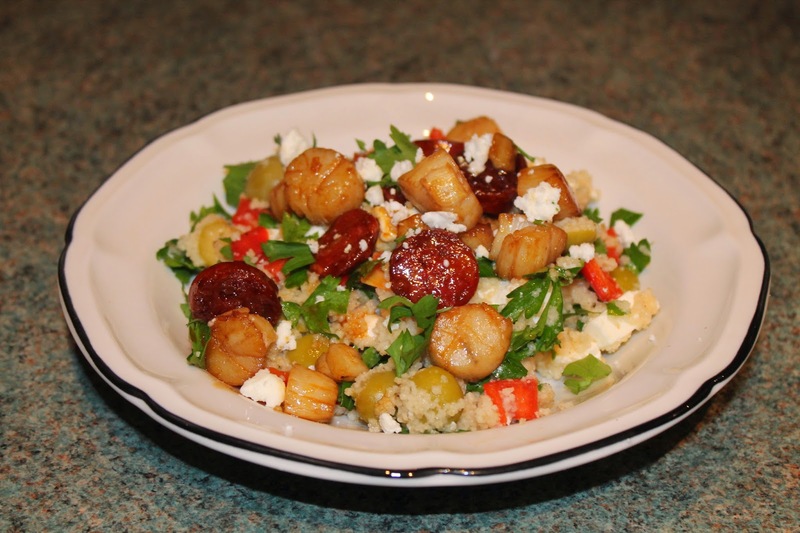 Everyone knows that chorizo and scallops work well together, but rather than being the star of a starter, in this dish they make a lovely Mediterranean style meal with bright, fresh flavours. 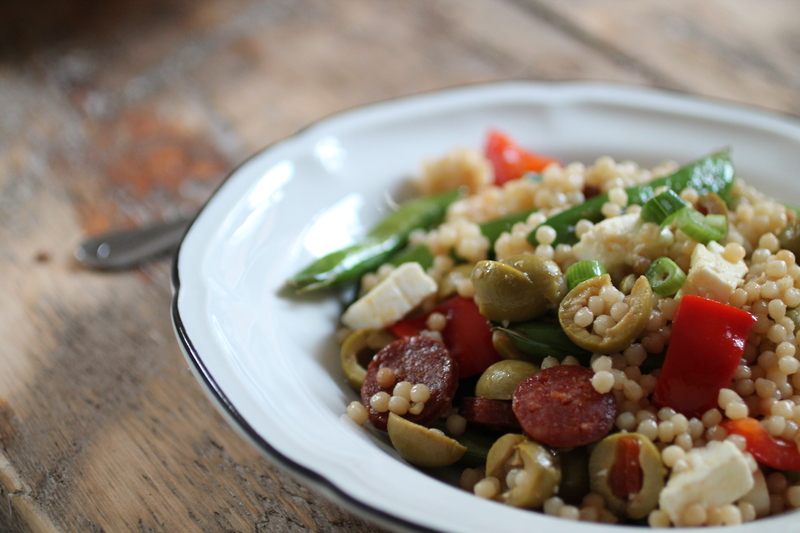 The cous cous would work well on its own, and is fantastic for lunches, but the chorizo and scallops add another level with their sweet sauce. 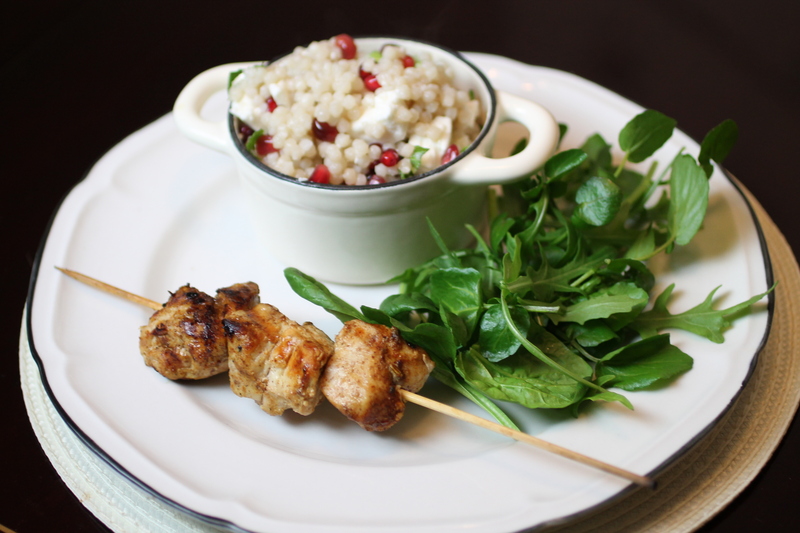 This will serve 4 and takes about 20 minutes to make in total. 1. For the cous cous, pour into a large bowl with 500ml boiling water. Sprinkle with a little salt and cover with a tea towel. Leave for 5-7 minutes until the cous cous has absorbed all of the water. 2. Fluff up with a fork, then add the finely chopped peppers, sliced mushrooms, olives, most of the chopped feta and most of the chopped parsley. Stir well and leave to one side. 3. For the chorizo and scallops, finely slice the chorizo and put in a frying pan over a high heat. Sizzle until the oil has been released and the chorizo is crisp. 4. Add the scallops and cook for another minute (depending on the size of the scallops), then stir in the balsamic vinegar and runny honey. 5. 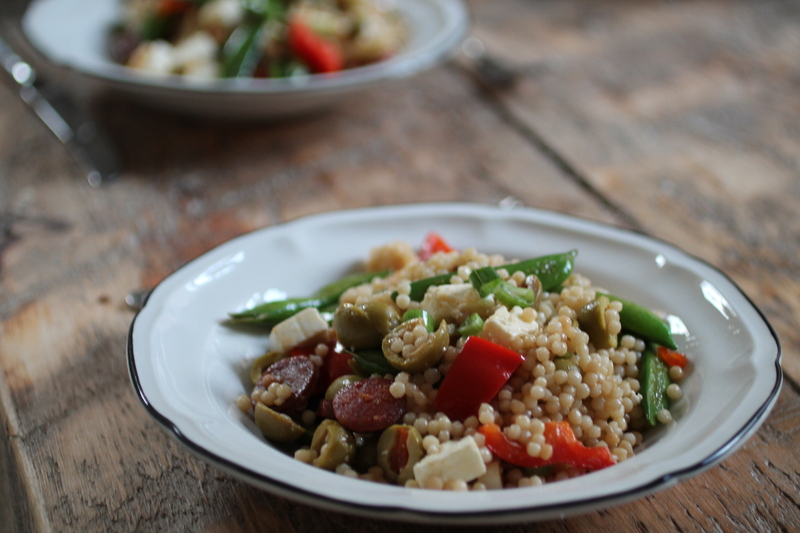 To serve, pile a mound of cous cous into each bowl, top with the chorizo and scallops (making sure you get plenty of the juice), then add a sprinkling of chopped parsley and crumbled feta.